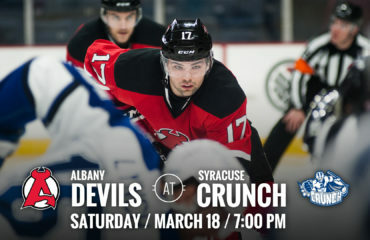 ALBANY, NY — The Albany Devils open the Calder Cup Playoffs Thursday at Times Union Center when they take on the Toronto Marlies for a 7 pm puck drop for Game One. 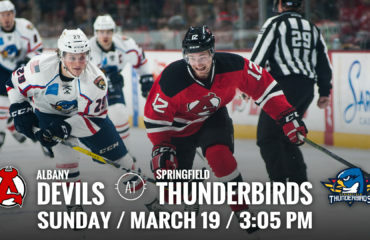 The two division rivals met eight times in the regular season, with the Devils going 5-3-0-0 in those games. Third seeded Albany finished the 2016-17 season with 83 points at 39-32-2-3 while second seeded Toronto finished with 89 points at 42-29-4-1. Familiar Faces: The two teams battled one another in the 2016 Calder Cup North Division Finals where Toronto came away with a late win in the final game of the seven game series on a goal by Richard Clune. Clune is one of 27 players from both teams’ current rosters who played in the 2016 series. The Devils have 11 returning players while the Marlies have 13, with Viktor Loov (ALB), Pierre-Luc Letourneau-Leblond (TOR), and Mike Sislo (TOR) each switching sides in the matchup. 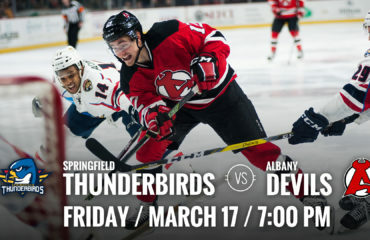 Experience on the Big Stage: The Albany Devils have 14 players on its current roster that appeared in a NHL game for New Jersey this season. Fleet-footed Miles Wood led the way, playing 60 games as defenseman Steven Santini logged 38 games. Additionally, forward Joe Blandisi has appeared in 68 NHL games over the past two seasons, tallying 26 points. 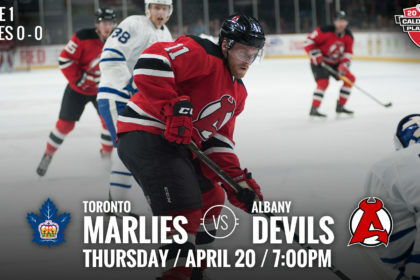 It’s Been a While: The Devils and Marlies have not faced-off since Feb 12, a game that saw Toronto come away with a 6-2 victory. Since then the Devils have played 25 games going 11-11-1-2 while Toronto has played 27 games going 18-8-1-0.